WORCESTER, Mass. - All season long, the Bartlett Indians have been known for their running and gunning offense, averaging close to 80 points scored per game. But Saturday in the Clark Tournament large school final, it was actually a stellar first half defensive effort that allowed the Indians to hold onto a 72-61 championship win. 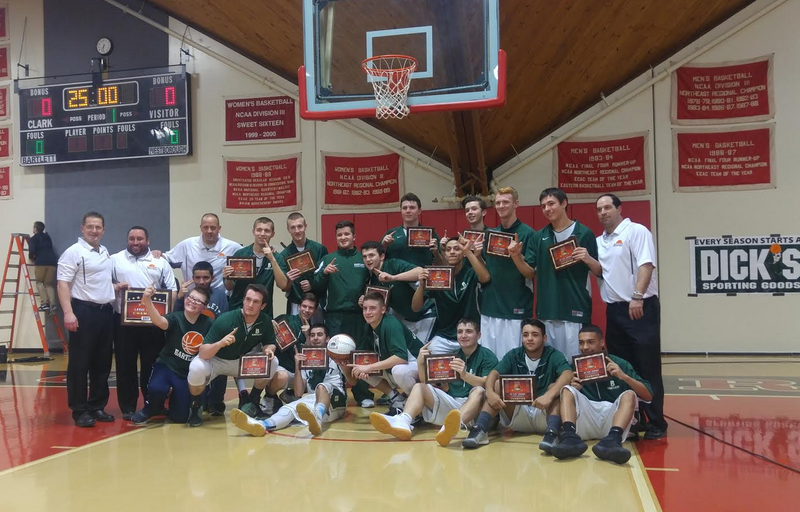 "We scouted (Westboro), and we knew the Doherty boys (Westboro twin brothers Mike and Matt Doherty) were both playing very well," Bartlett coach said. "They're both seasoned, even though they're only sophomores, so we came out in a triangle and two to take them away." Bartlett (19-3, 12-0 SWCL B) jumped out to an early 7-2 advantage, but Westboro (14-8, 3-5 Mid-Wach B) bounced back to tie things up 16-16 by the end of the first quarter, thanks to James Coffey, AJ Nowak and Dom Caspariello picking up the offensive slack. When Bartlett had the ball, however, the Rangers had no answer for Indian senior Tyler Davern. The physical and versatile forward dominated in all phases, scoring 28 points, grabbing 15 rebounds and blocking 5 shots. Davern's all-around play helped Bartlett create a little space in the second period, and jump out to a 36-26 halftime lead. Davern's emotion was apparent on both ends, as the normally reserved senior was seen pounding his chest and pumping his teammates up between plays. "I don't want to say I just got up because this is a championship game," Davern said. "But this was obviously huge for us, and being a senior, I wanted this one really bad." In the second half Bartlett switched to a straight man-to-man defense, and continued to dominate on the offensive end. Bartlett led by double digits the rest of the way, but was unable to put Westboro away until the game's final three minutes. Most of that was a testament to Westboro's resilient effort, but also the hot shooting of Jake Hughes, who finished the night with a team-high 15 points, with three made 3-pointers. "Every night for us, it's a different guy," Hughes said afterward. "The other night it was Mike and Matt, and tonight it was me.. But, we knew they were gonna come out running, and we tried to stop the ball and slow things down. We just came up short." The Indians will now head into the Division 3 Central tournament with a head full of steam. Bartlett enters the bracket as the top seed, and will host the winner of Monday night's Oakmont at Leicester game. Westboro, meanwhile, will look to capitalize on a largely positive Clark Tournament experience. The Rangers enter the D2 Central bracket as the 7-seed, and will play at league rival Groton-Dunstable next Thursday at 7 pm.